The list of honors for Oklahoma's Buddy Hield continues to grow. The senior guard was named to another All-America team, this time garnering first-team honors from the National Association of Basketball Coaches. Already a first-team All-American by the United States Basketball Writers Association, Sports Illustrated and USA Today, Hield becomes OU's first NABC All-America First Team selection since Blake Griffin in 2009. Voting was conducted by member coaches of the NABC in NCAA Division I. Joining Hield on the first team were Virginia guard Malcolm Brogdon, North Carolina forward Brice Johnson, LSU forward Ben Simmons and Michigan State guard Denzel Valentine. Hield's 2015-16 achievements are staggering. On the season, the Freeport, Bahamas, native is averaging 25.4 points (ranks second nationally), 5.7 rebounds (ranks first among Big 12 guards), 2.0 assists and 1.1 steals in 35.4 minutes per game. He's shooting .504 from the field, .465 (146-314) from 3-point range (ranks fourth in nation) and .880 (176-200) from the free throw line. His 4.1 treys per game pace the country. 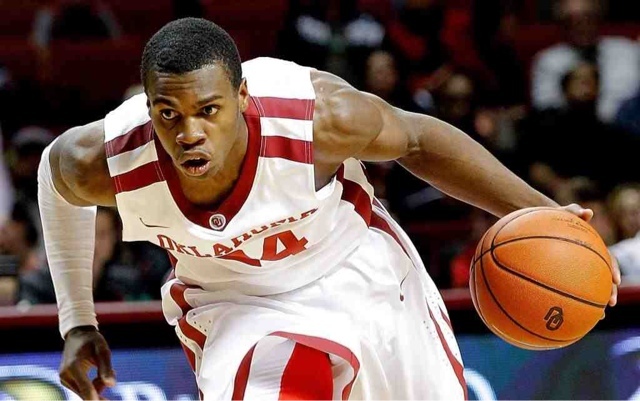 Leading the Sooners to their first Final Four berth since 2002, Hield has scored at least 20 points in 26 of 36 games this season and at least 25 points in 19 outings. His nation-leading 12 games of at least 30 points are the same number as the rest of the Big 12 combined. Hield has also scored at least 20 points in a half 10 times this season. Only one player in the Final Four (Syracuse's Michael Gbinije with 13) has more 20-point games this year. The two-time Big 12 Player of the Year is OU's and the Big 12's No. 2 all-time leading scorer with 2,285 career points. He needs just three points to tie former Baylor guard LaceDarius Dunn for the conference's top spot, and needs just 16 points to tie Wayman Tisdale for the OU single-season scoring record (932 in 1984-85). Malcolm Brogdon, Virginia, 6-5, 215, Senior, Guard, Atlanta, Ga.
Brice Johnson, North Carolina, 6-9, 228, Senior, Forward, Orangeburg, S.C.
Denzel Valentine, Michigan State, 6-5, 220, Senior, Guard, Lansing, Mich.
Kris Dunn, Providence, 6-4, 220, Junior, Guard, New London, Conn.
Perry Ellis, Kansas, 6-8, 225, Senior, Forward, Wichita Heights, Kan.
Georges Niang, Iowa State, 6-8, 230, Senior, Methuen, Mass. Tyler Ulis, Kentucky, 5-9, 160, Sophomore, Guard, Chicago, Ill.
Grayson Allen, Duke, 6-5, 205, Sophomore, Guard, Jacksonville, Fla.
Kay Felder, Oakland, 5-9, 176, Junior, Guard, Detroit, Mich.
Yogi Ferrell, Indiana, 6-0, 180, Senior, Guard, Indianapolis, Ind. Josh Hart, Villanova, 6-0, 205, Junior, Guard, Silver Spring, Md.